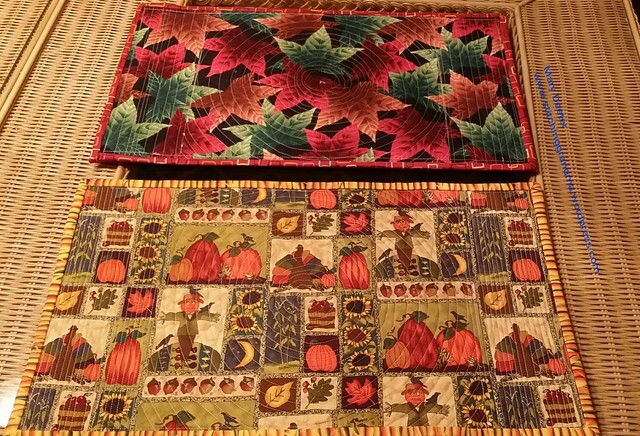 I continue to work on my “Autumn Jubilee” placemats. The only time I work on them is when I go to a quilt bee once a month. Last week I had a “Material Girls” bee on Wednesday. My “Autumn Jubilee” tote of fabric is what I have been hauling to bees for months. I get a little more done each time. I’ve made a total of 4 since January of this year. I managed to get the binding on 2 out of 4 in the last week. 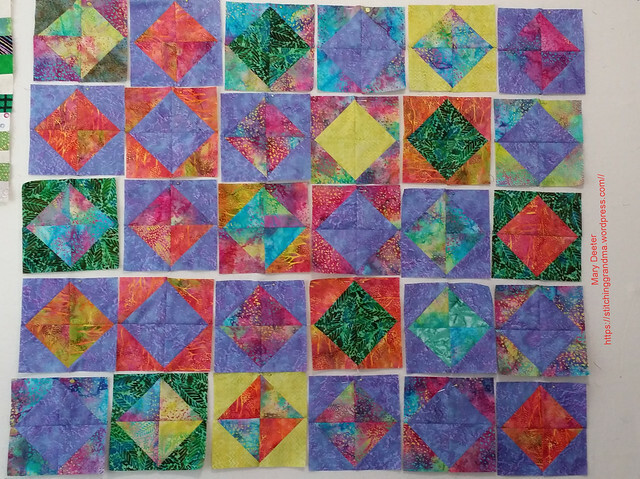 It is going to be a rainy afternoon, and I think I will make some more binding for the last 2. That will give me 8, and I think that is where I will stop. I am linking up to OH SCRAP – OH SCRAP! to share my scrappy Autumn Jubilee placemats. Quick update on projects completed last week. 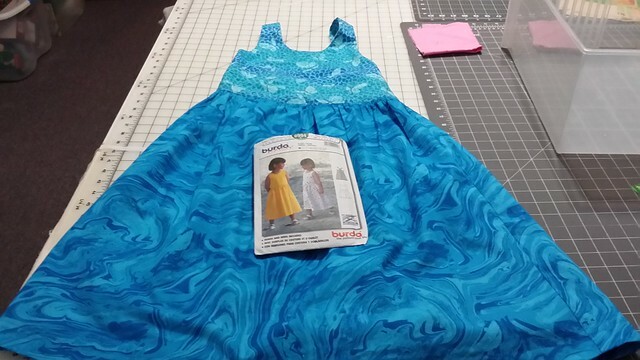 Sewing for the grands – 2 dresses completed. The first one below required a zipper, which I managed (thanks to YOU TUBE!). Pattern is BURDA 6309. I might have mentioned before that zippers scared me in 7th grade Home Ec. This one went in successfully, and I attribute the success to my friends who offered advice and You Tube. This pattern was made in a size 5. Since we were going to visit on Saturday, I decided once I had the zipper in the dress above to make another dress from the same fabrics. I made this one in a size 4. I used the same fabrics, but a very simple pattern. It was fairly easy, except for those darn string ties, which took me a lot of time to turn. I started it after dinner, and worked on it until midnight. No zippers , no buttons. That’s it for sewing for kids for a while. 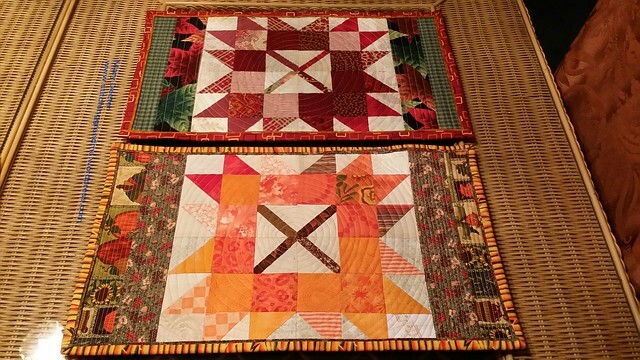 Back to quilting. What are you working on? Anything scrappy?? Be sure and go check out the link above for OH SCRAP! 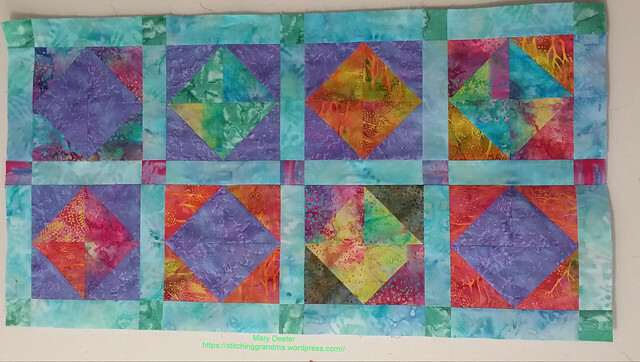 It is inspiring to see what others are making using scraps. 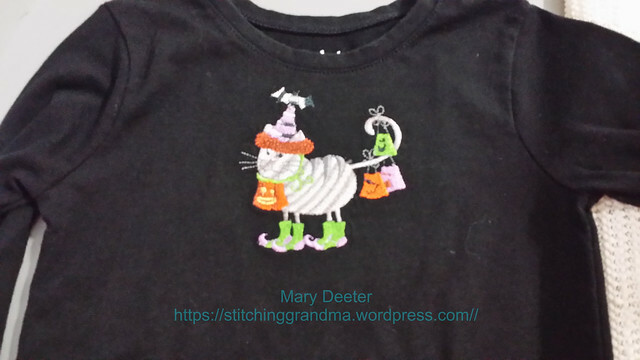 I took a mini-vacation from sewing for a week while 3 of my grandkids were visiting. They are so active and busy during their visits that sewing is not an option. (My sewing space is not “kid safe” currently with all the excess stuff I have from 2nd Time Around and my friend June’s sewing room stuff). I am usually up around 6 am, and shortly after getting up, the youngest is awake and we get 15 or 20 minutes of time together before the household is up and moving. She wanted to pick out fabric for 2 dresses and we did get a few minutes of time to do that. She likes to touch the fabric and make combinations that please her 6 year old eye! 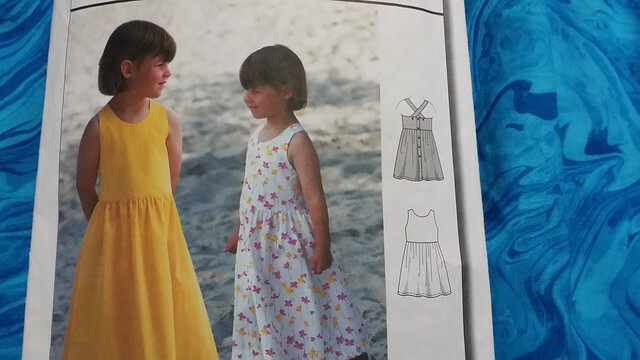 I also got out my bin of kids patterns and she selected a pattern for her second dress. We were “too busy” to sew while they were here. Our week was full of adventures. We rode bikes at a nearby state park one morning and had a picnic. Another day we got together with their cousin & aunt for a some beach fun. Their aunt brought pizza for dinner one night. We went to her house to play and swim one day. Lots of great time with play time with cousins. I hope they were building memories!! Of course, playtime with remote control cars and Grandpa, and bike riding at home. We went to an evening concert at Abbott’s Mill Nature Center and enjoyed another picnic. Every afternoon there was time spent in the pool to cool off and relax. My daughter and Grandpa and I enjoyed floating around watching the kids splash and play. All that time at the YMCA over the winter has made them into great swimmers. Swim lessons for kids really built their confidence. The 2 oldest kids figured out how to use snorkels and had fun staying “underwater”. Hopefully they had a good week of fun, and my daughter enjoyed a little break from her normal household responsibilities etc. She, of course, still had to “mother”, but not worry about meals and chores and the boxes that still need unpacked for a few days. We enjoyed lots of time to visit too. Once they headed home, I went to my sewing room to work on the 2 dresses. The patterns were chosen for each dress already, and I very easily constructed the sundress . This was the 4th time I have made this pattern, by BURDA,# 9994, this summer and it went together in a few hours. I spent as much time tracing the pattern to a size 5 on butcher paper as I did cutting out the dress! I know have the pattern traced in a size 3 & 5, and the original goes from 18 months to size 8. Too bad summer is nearly done, as I have this pattern down!!!! I was ready to put the buttonholes and buttons on at the end of the first round of sewing late Friday afternoon. On Saturday afternoon I did buttons and buttonholes and the dress was finished. I had to give it a good wash (to get my chalk marks off the back where the button holes are), and it is ready to pop in the mail. I will do that this morning! This granddaughter turned 6 while she was here, and I know she will enjoy getting her dress “in the mail”. The second dress has taken me quite a bit more time. 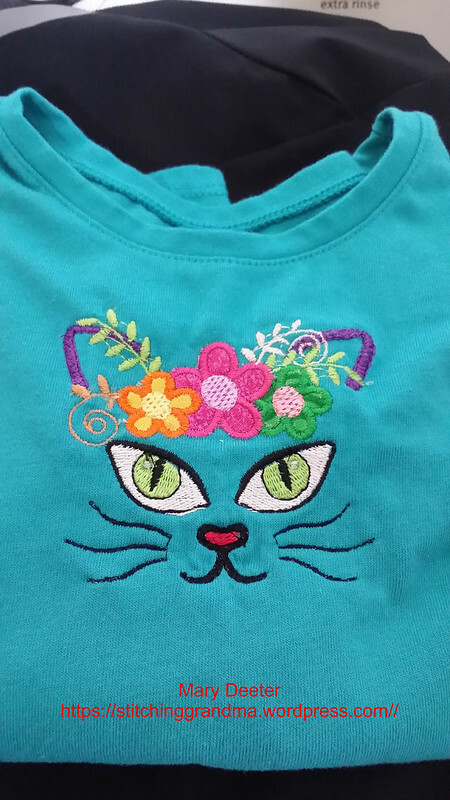 It has a collar and sleeves, and calls for a zipper. Granddaughter chose dress B in the lower left corner. I traced that pattern into a size 5 on butcher paper on Saturday, and got everything cut out. 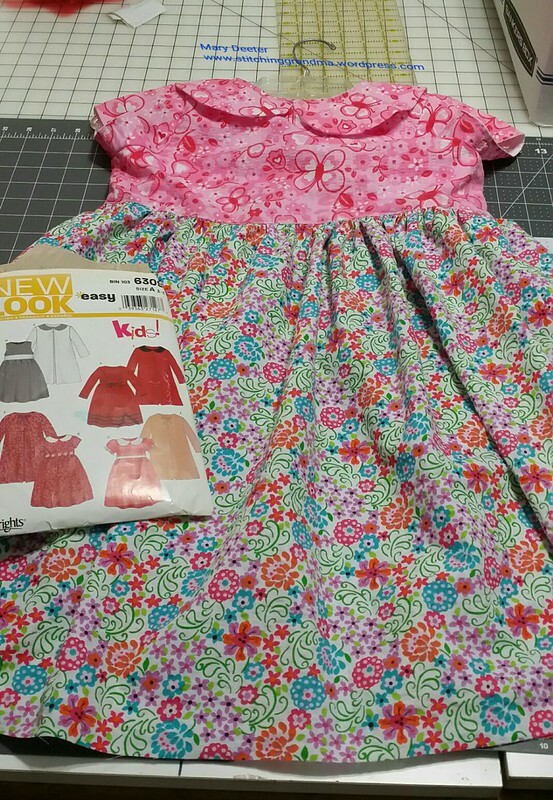 On Sunday I started to work through the directions, making the collar, the sleeves and the bodice. 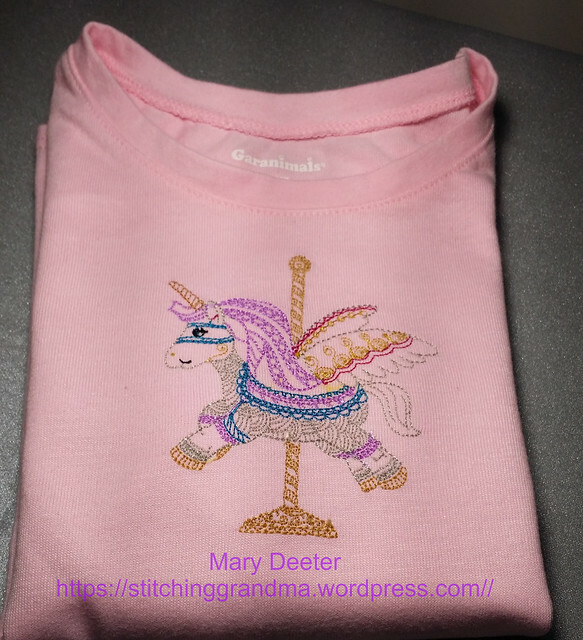 I learned about “easing” stitches for the sleeves. I love how full the skirt is with all the gathering. I still have to shop for the right zipper to go into the dress, and dig in the trim bin for the trim around the waist. I have lots of zippers, but nothing appropriate. I have it nearly finished with the exception of the hem and zipper and the trim. I am TERRIBLE about reading patterns, and had to “redo” the sleeves. Thankfully I had plenty of fabric. I think she made a fun combination of fabrics. She wanted contrast, and she got it! Hey, when you are 6, you can mix plaids and stripes, right? 🙂 I think the 2 prints are cute. I would not have chosen them to coordinate, but she liked it! I didn’t get a chance to work on the dress on Monday. I spent my morning with my youngest daughter and granddaughter, taking a 6 mile bike ride at the beach, followed up by a ride north to pick up some fabric for 2nd Time Around and a long nap! Before dinner I did a little “tidying up” in my sewing room so I could get near my embroidery machine. My sewing desk was buried under dress patterns, and batik strips and sundress fabrics. I can now “see the top” of the desk. An hour well spent putting patterns away, labeling folders and pattern boxes, and putting batik strips in a basket. (Yes, the placemats are still a work in progress…of course…another UFO). I needed to stitch out a couple of “die-line” files for Embroidery Club today, and get my “gear” packed for going today. I have “minimized” how much I am taking, but did throw in a couple of extra pieces of fabric, and 5 extra spools embroidery thread. We are doing an Embroidery Library “in the hoop” key chain project and I will write about it once I get it done. 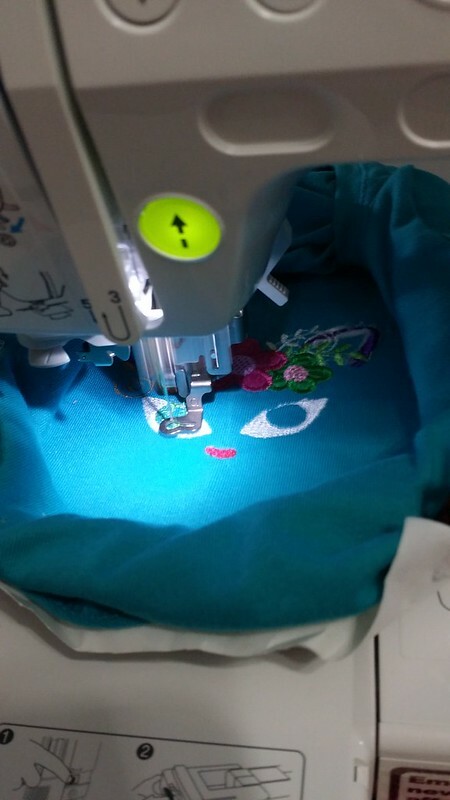 The rest of the week is pretty busy with Material Girls Bee on Wednesday, and an afternoon of sewing at the Assisted Living Center on Thursday, and 2nd Time Around on Friday morning, along with lunch and swimming with the ladies on Friday afternoon. I am hoping to finish this dress before Saturday morning when we head over to the DC metro area for that 6 year old’s big birthday bash! (Debating a bike ride on Wednesday evening or sewing……hmmmm) Deadline is looming on this one! 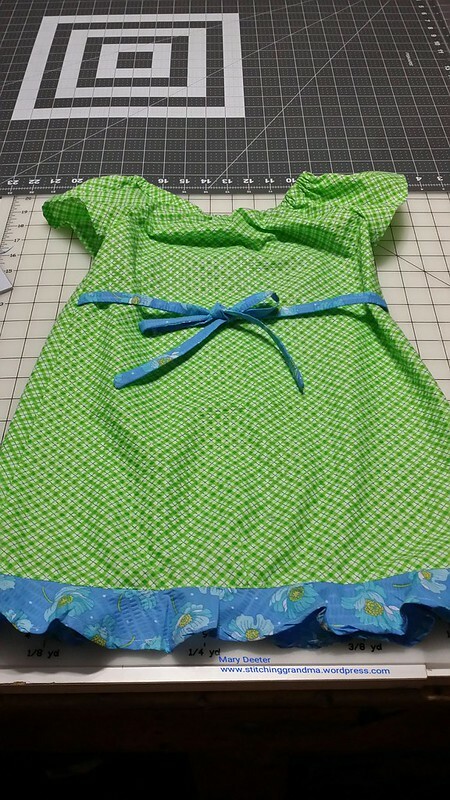 In a previous post this month I mentioned making a sundress (https://stitchinggrandma.wordpress.com/2018/07/05/summer-sewing/ ) with fabric my 8 year old granddaughter chose. That dress went off in the mail yesterday after I put a size tag in it. 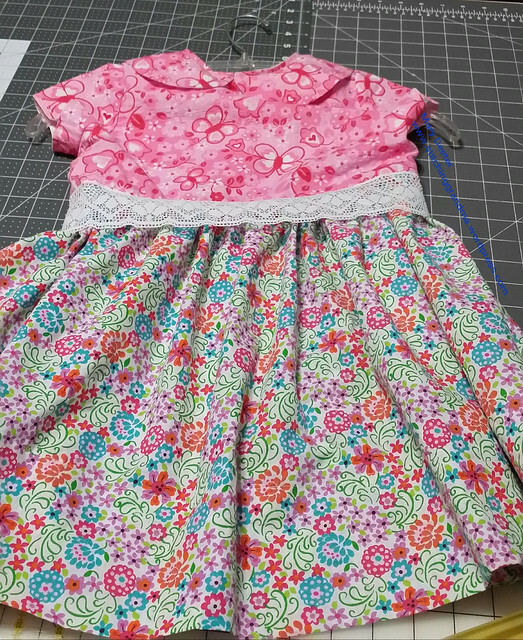 When I finished her dress, I pulled fabrics that I considered “suitable for sundresses” for young girls. 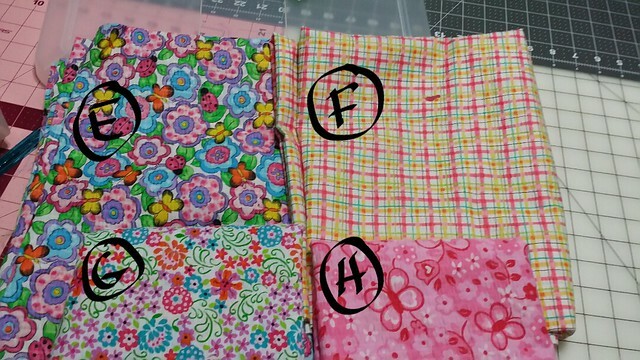 Look at these fun fabrics! I’d forgotten I had an entire tote full of “tutti fruiti” fabrics. This batch is that puckery Tutti Fruiti fabric. I have a couple of yards of each print. 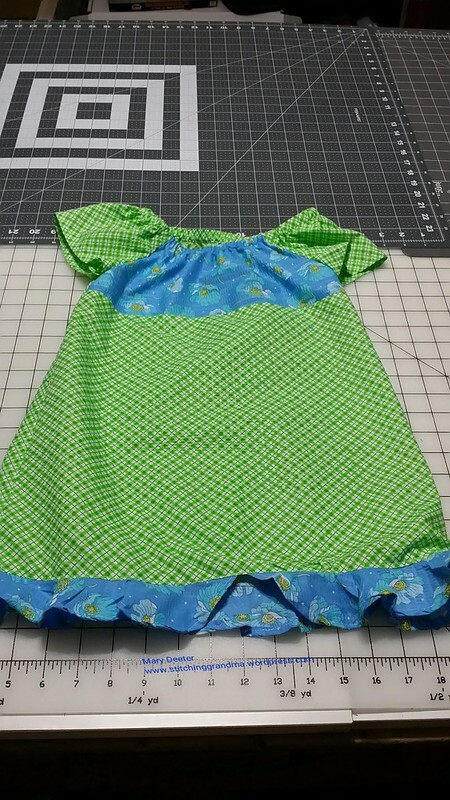 I think I used the green plaid (c) in a sundress a few years back. This group is my favorite of all the prints. Again, it is the puckery Tutti Fruiti fabric and I have at least a yard or more of each. These two are also Tutti Fruiti, and are coordinating prints. They would make a nice outfit together. They of course don’t play well together but each is fun on it’s own. 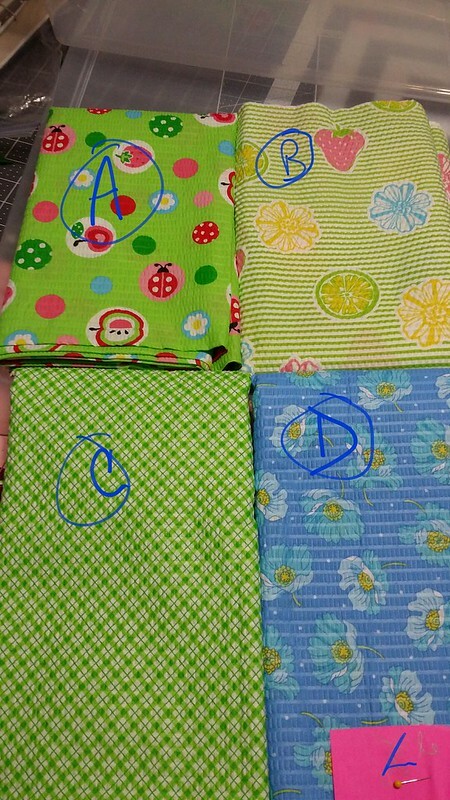 I must look for some lime green to go with that fabric I marked with a J. These are quilters cotton. They are soft, lovely cotton pieces that don’t scream “kid fabric”. That box was overflowing, so I pulled out ALL the pinks and refolded them (ruler fold), and created a container of “just pink”. Now both lids will close. 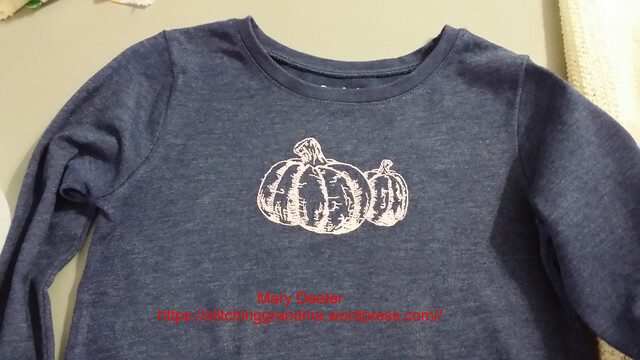 Meanwhile…..I decided to start on a size 3 for the littlest granddaughter. She didn’t get a choice in fabric selection, I chose for her. 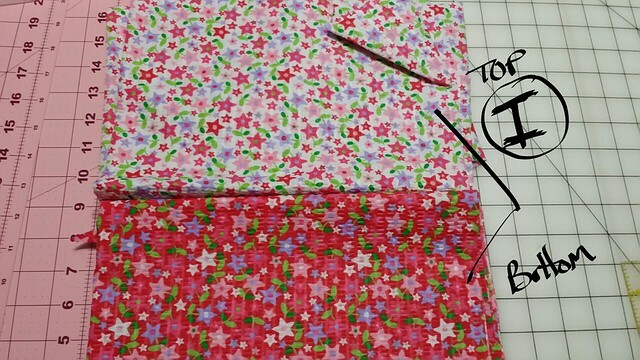 I chose a yard of fabric E, and after the pattern tracing got started with the sewing. 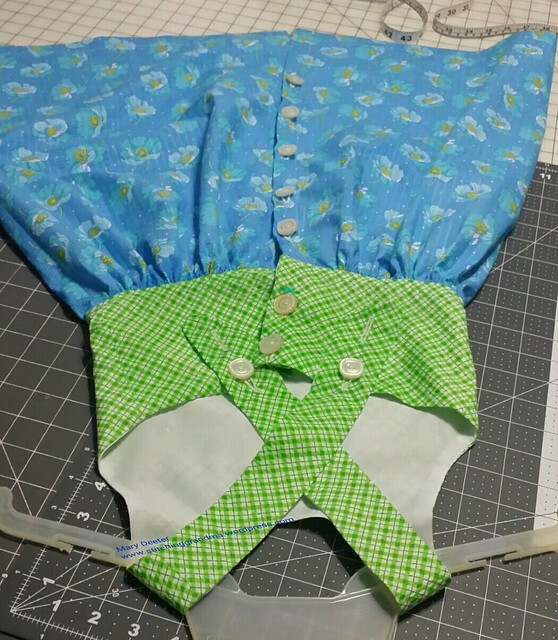 I finished up today, attaching the bodice to the skirt, making the button holes and sewing the buttons on by machine. The dress is in the wash and ready to deliver tomorrow. 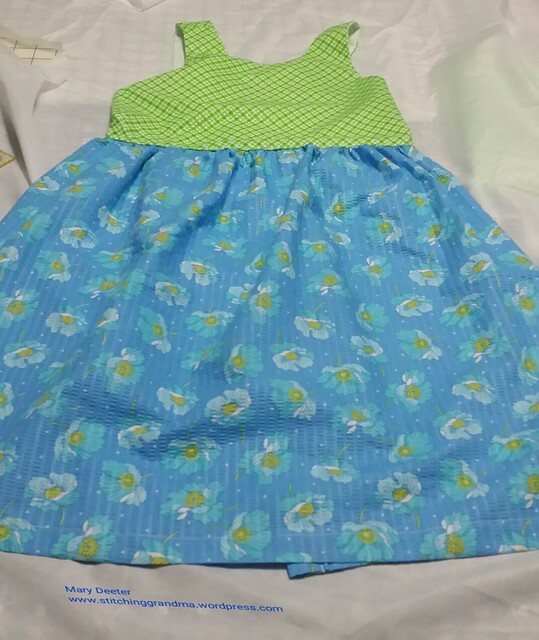 Size 3 sundress – back – 11 buttons! I can’t wait to try it on my youngest granddaughter and see if I guess right on the size. 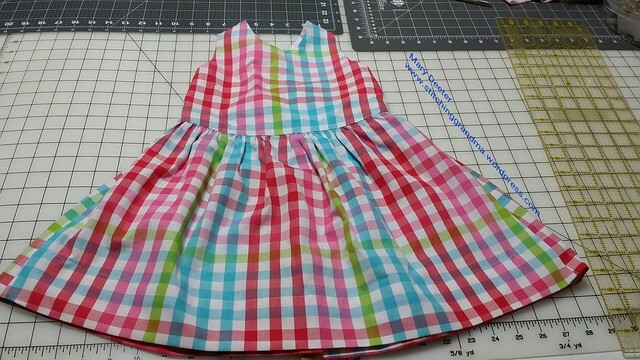 I always find commercial garment patterns to run rather large, or maybe I just have small grands. I’ve never recorded her measurements, but this grandma is taking the tape measure along tomorrow when I deliver !! Middle granddaughter will make her fabric choices when she is visiting in August. 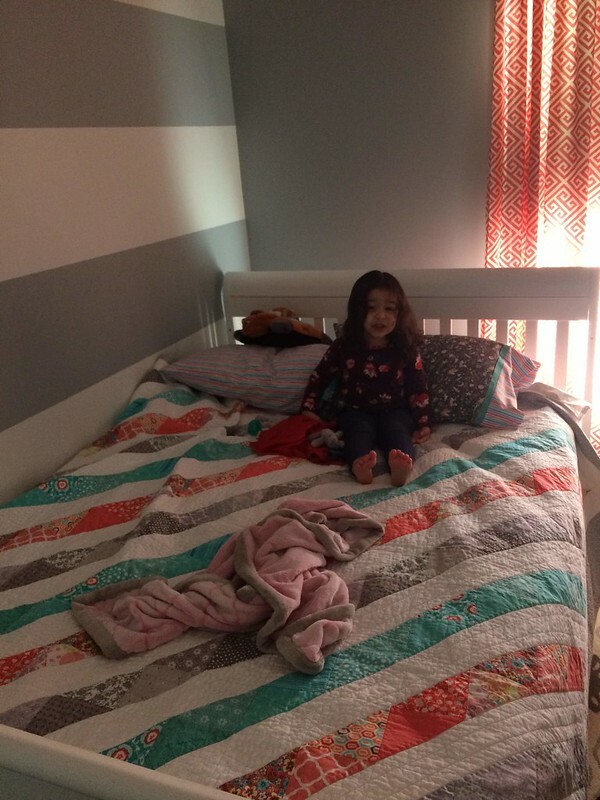 Her mommy said she is SO excited about all the fabrics and getting to chose! 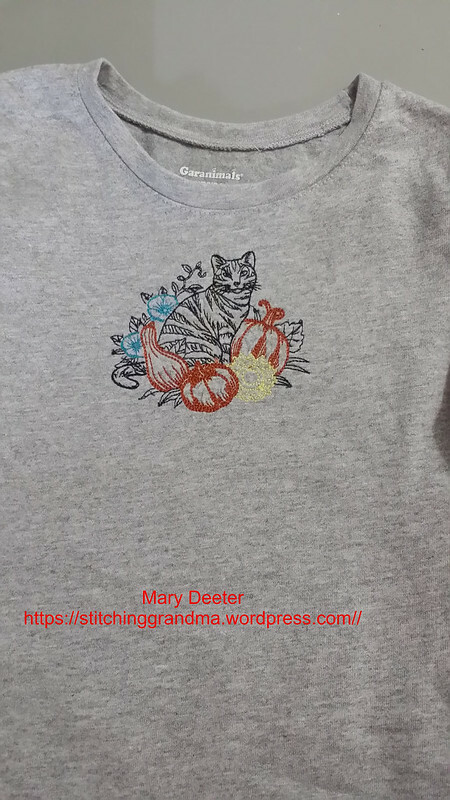 That’s all for this StitchingGrandma this week! What have you been up to lately? 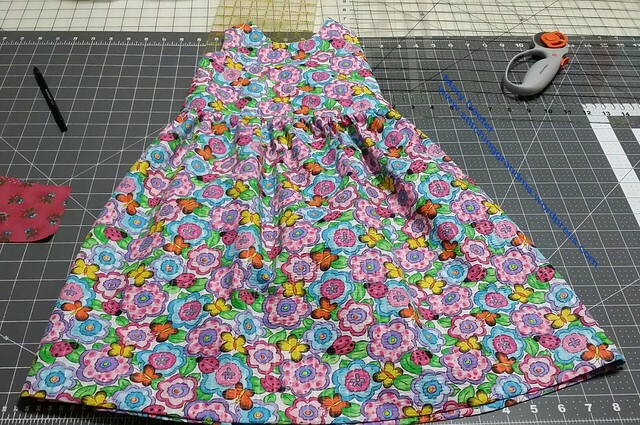 I have been doing a little summer sun-dress sewing. My grandchildren were here for a bit in June, and the 8 year old wanted to pick out fabric for a sundress. Her favorite color is blue. I was not surprised with her fabric combinations. 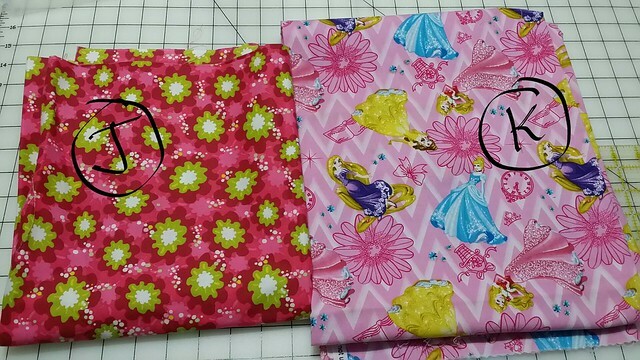 The fabric on the top is tutti fruiti and the bottom is a batik like print. Both are 100% cotton and we chose a piece of white cotton to line the bodice. 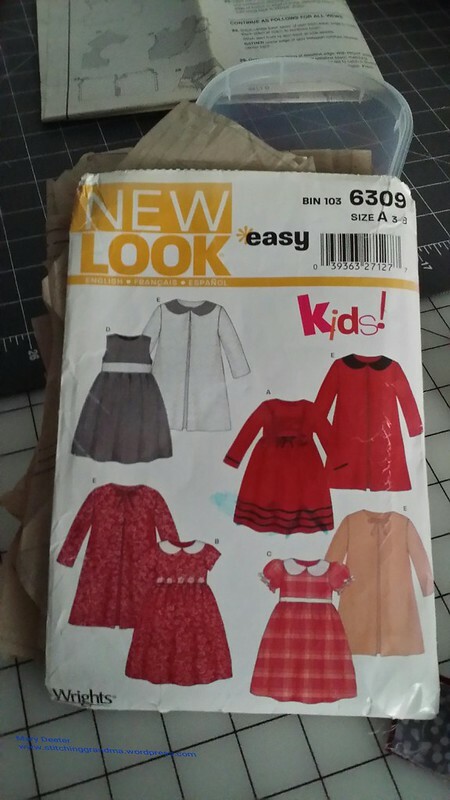 Challenges – CRUMMY directions on the pattern by Burda. 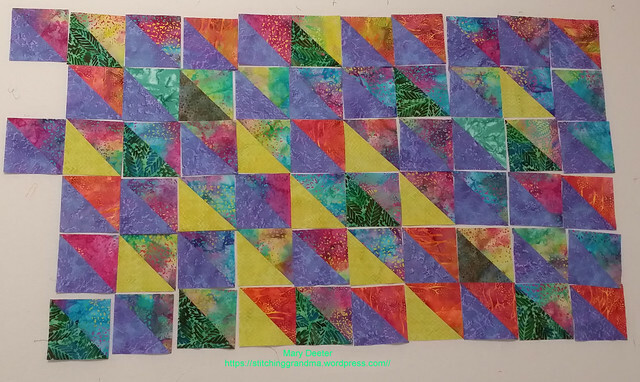 (I always say this about patterns for garments….hey, I’m a quilter and I need pattern makers to assume I have never sewn before!) 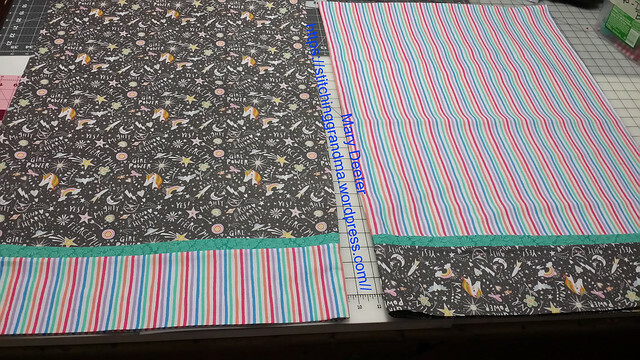 I overcame the challenges because I have sewn before, but gosh if I hadn’t…… There were very few alignment marks on the pattern, and no marks for aligning buttons or number of buttons etc. I just got out the ruler and chalk and figured it out for myself! 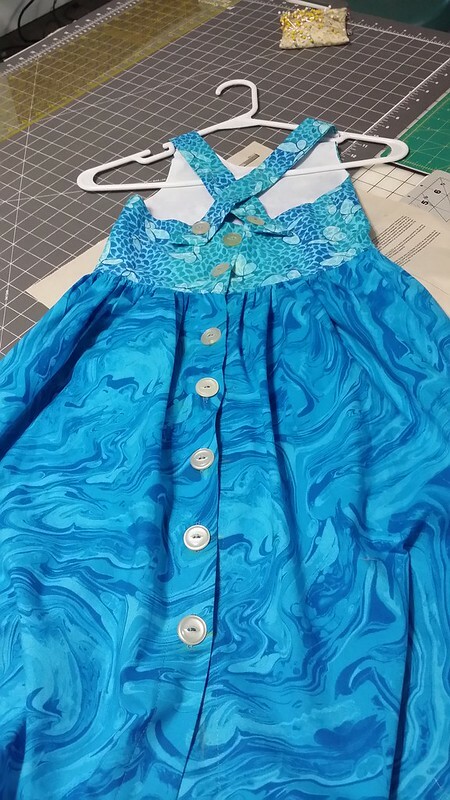 Buttons….the dress sat for 2 weeks waiting for buttons and buttonholes. I decided to tackle them one day this week, and got out the book for my machine and did some “test buttonholes”. Then I tested sewing the buttons on by machine. Lessons learned during practice were my machine did not like the small spool lying on it’s side, and jammed up the thread. I put that small spool on my thread stand it ran perfectly. But while I was fixing the jam, I cleaned the entire bobbin area of my machine, since I had the plate off. (Been a bit since that has happened….) Also, the button sewing on foot and setting were EASY to use! I chalked where the buttons were to be placed and went for it after only practicing on 1 button on a scrap. The other lessons….I think the button hole foot/ making function is fine, once I got my eye on the chalk line where I wanted the button to be etc. I don’t think that “one pass” with the stitching is enough. It seems flimsy to me. My friend suggested to make a 2nd pass before moving on to the next button hole. Great advice from Nancy. The button sewing function only did about 6 stitches, so I ran it 3 times before moving on to the next button. Hoping those buttons stay put! 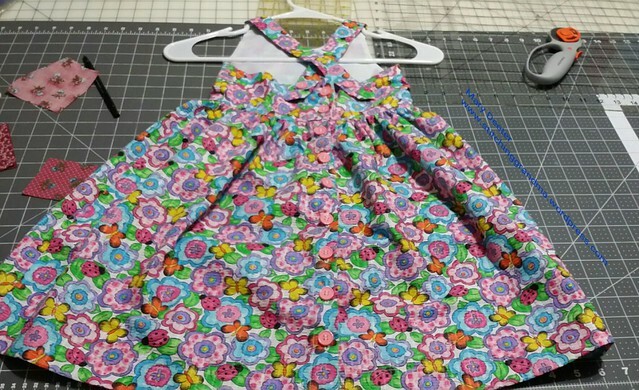 This dress will go off in the mail this week, and I have started one for the 2 year old granddaughter.. Her’s will be all one fabric, in a tutti fruiti material, and I will post a photo when finished. 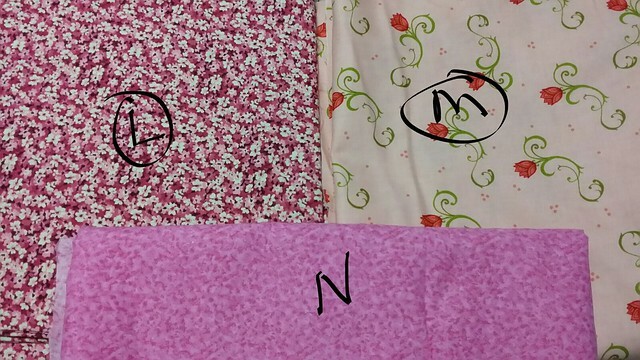 Middle granddaughter is going to “select” her fabric next time she visits. I sent her lots of photo options of fabrics, but she likes to “feel” the fabric! Completely understand sensitive skin and like a quilter, who doesn’t like to go around the fabric store and touch it all! Is anyone else as “pattern direction challenged” as me??? 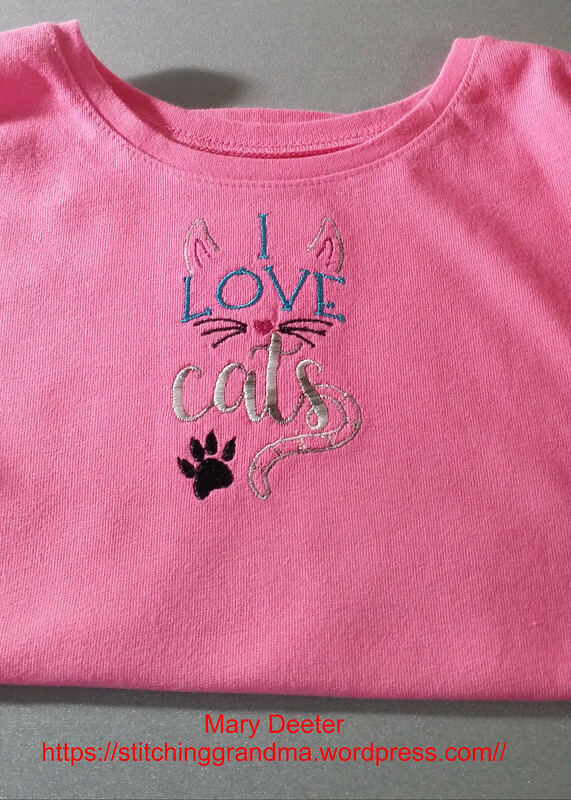 I do enjoy sewing for the girls, and figure once I master the directions I better make one for each! I don’t think it will bother them to have the same style dress in with 3 different fabrics. Hope not! Ohhh….must remember to put a size tag in the side seam of the skirt, out of the way where it won’t scratch.